At our former residence, the blueberry harvest from our six plants was outstanding; there was plenty for us, as well as the birds (note: add netting). The six southern highbush varieties that we planted there included Sharp Blue, Jubilee, South Moon, Blue Ray, Sunshine Blue and Misty. That was about 10 years ago. Since then, we've moved. However, there will always be room for blueberry plants in our yard. Now, we are in the process of choosing newer or preferred blueberry varieties. Time and experience has refined our blueberry taste buds and we are developing a more functional approach to blueberry culture (that's fancy talk for saying, "We want bigger blueberries. They're easier to pick!"). The development of southern highbush blueberry varieties is a boon for Central Valley gardeners, who must cope with hot summers and low chill winters. According to the UC Cooperative Extension, rabbiteye blueberries grow in the southeastern part of the country and thrive in hot, humid weather but are not cold hardy. Lowbush blueberries grow in the northeastern states and Canada. Northern highbush blueberries grow from Florida to Maine and the northern tier states and have a high chilling requirement that limits their adaptability. 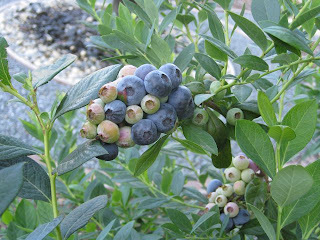 Southern highbush blueberry varieties have a low-chill requirement and are heat tolerant. 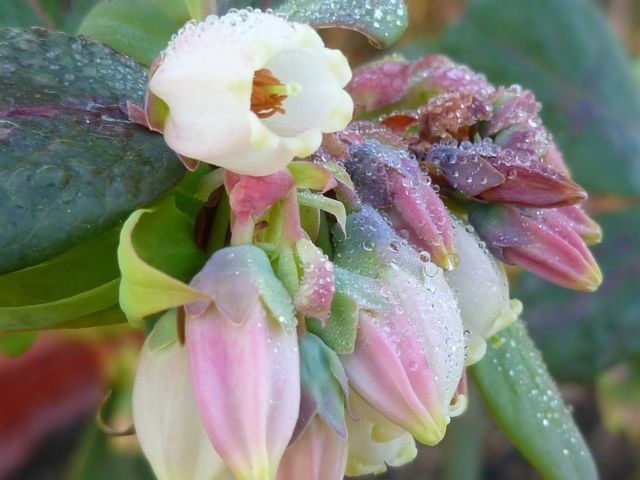 Although they are self-pollinating, blueberry fruit set will increase and berries will be larger if two varieties are planted together. Most varieties grow 4 to 6 feet tall here. 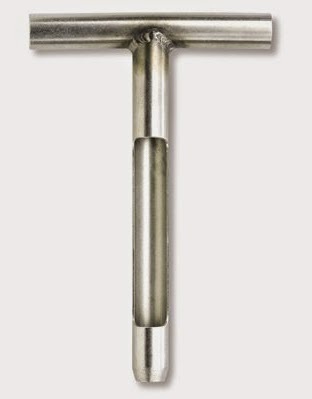 A few, such as Sunshine Blue (3'), are more compact. A UC Master Gardener variety trial in Santa Clara found that the following varieties grew the best, produced the biggest crops, and had good to excellent flavor: ‘Reveille’, ‘Misty’, ‘Sunshine Blue’, ‘Bluecrop’, ‘Georgia Gem’ and ‘O’Neal’ (a large berry variety). Other varieties that may also work well include ‘Blue Ray’, ‘Cape Fear’, ‘North Blue’, ‘Ozark Blue’, and ‘Sharp Blue’. 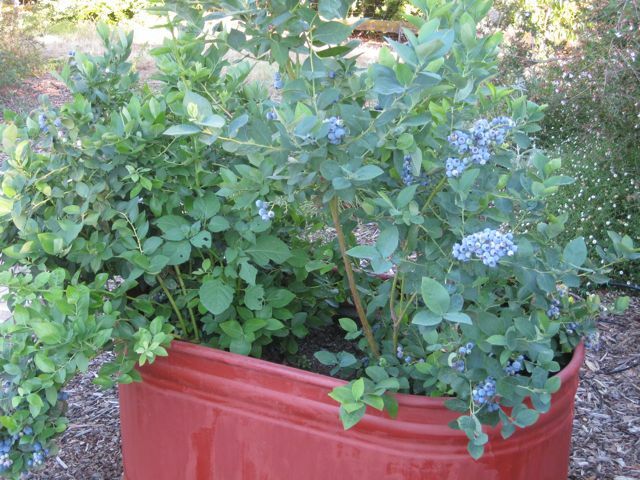 • Plant blueberries in a good-sized container. 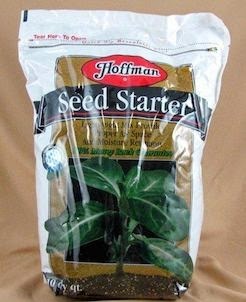 You can start them off in five gallon containers, but a 15-gallon or larger is preferable. At our old place, we used galvanized steel watering troughs from the local farm supply store. The best paint to use turned out to be tractor paint. Blueberries need good drainage, so be sure to drill holes in the bottom and along the lower sides. Raise the troughs an inch or so off the ground to improve drainage. Use the holes along the lower sides to run drip irrigation tubing to water the plants with in-line emitters or microsprayers. • Give the blueberries acidic soil. Use a one-third mix of potting soil intended for camellias and azaleas, 1/3 peat moss or coir, and 1/3 small landscape bark, along with a handful of soil sulfur. 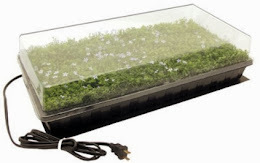 This will give the blueberries their ideal pH growing range of 5.5-5.8. • Blueberries need consistently moist soil, but be sure the pot has good drainage. • Because containers can heat up here in the summer, place them where they can get some afternoon shade. 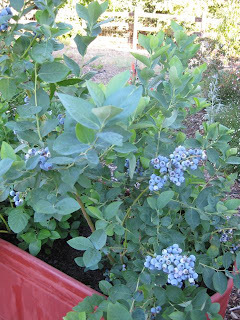 • Feed blueberries with an organic fertilizer. Apply during the blueberry-growing season, late winter through summer. Organic fertilizers such as blood meal, cottonseed meal, fish meal, and alfalfa meal can be applied at a rate of 1 pound per plant. 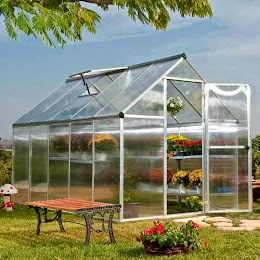 • Having several containers with different varieties will improve pollination and give you an extended harvesting season. If you want a sure choice, go with Sunshine Blue. 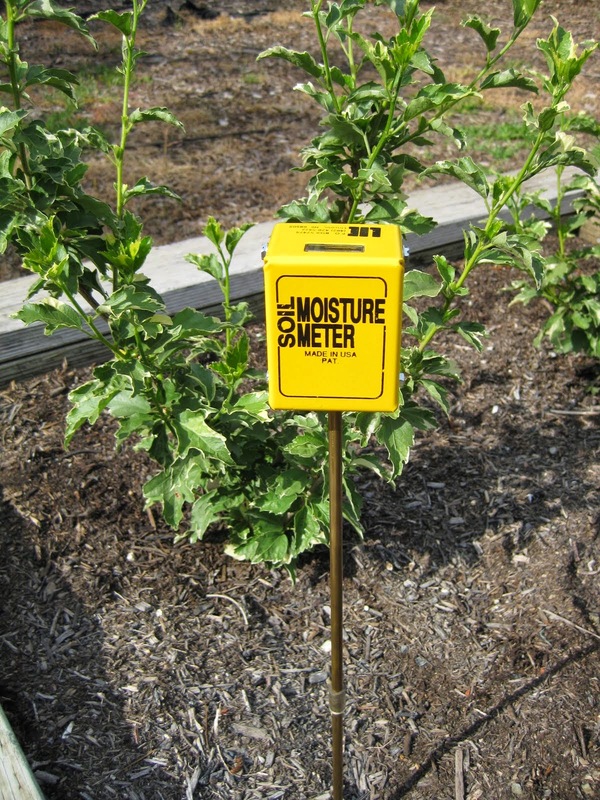 Although a smaller shrub (about three feet tall, with small berries), it has very low winter chill requirements and tolerates higher pH soils better than other varieties. 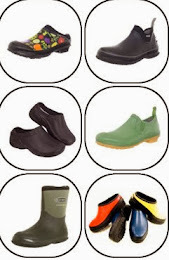 • The University of California advises growers of blueberries in containers to replace the soil with fresh potting mix as well as root prune the plant every 3 to 4 years. Pruning Blueberries. Even though most of the blueberry bushes intended for here only get about five feet tall, they would benefit from some judicious pruning. According to the American Horticulture Society book, "Pruning and Training", blueberries should be pruned in late winter, when the fruit buds are readily distinguishable. Prune back the shoots growing horizontally and any weak growth, cutting to an upright shoot or low bud. Prune out the oldest and weakest wood near the base of the plant to encourage strong new growth and remove any growth spreading out toward the ground. Cut out no more than a quarter of the bush annually. However, as we know, all gardening is local. 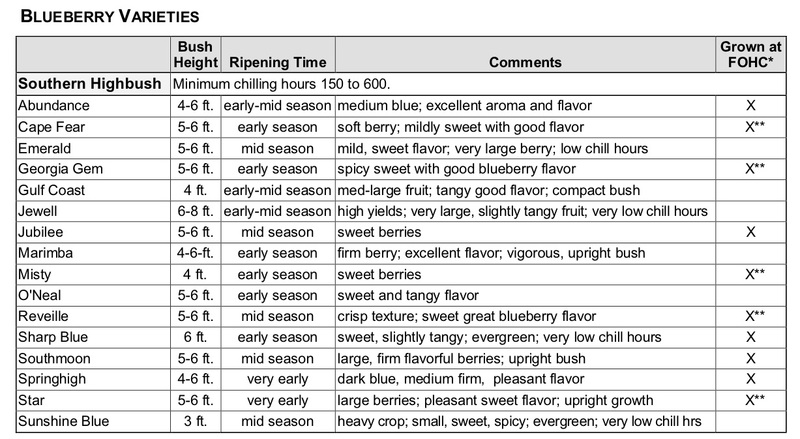 That pruning advice is intended as general guidelines for a nation of blueberry growers. What about the blueberry gardener here in the Central Valley? 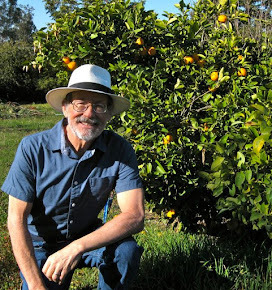 Ed Laivo, of Four Winds Growers, has some different ideas, based on his own experience. "For our area, the southern highbush blueberry varieties are best," says Laivo. "Most advice refers to the northern highbush blueberry. The southern highbush blueberry is more tolerant of our heat and lower humidity, doesn't require as much winter chill and has been bred to be planted in the ground in full sun here." Blueberry branches have a limited number of productive years, perhaps two or three. 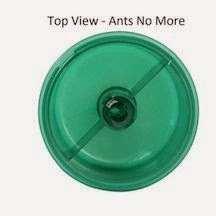 Laivo says to remove them after Year Two. "For major pruning, I wait until February, before the buds open," advises Laivo. "Then, I'll prune back the plant lightly after harvest to keep the plant in bounds." 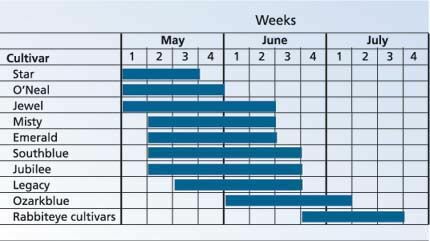 Contrary to the advice in the American Horticulture Society book, Laivo says that the winter pruning can be as much as 50% of the plant. "But try to remove totally any branch that is over three years old. Those won't be very productive. By pruning those out, you'll spur new branch growth at the base." And if a blueberry planting is in your future garden plans, Laivo says to get more than one. "Blueberries will yield a much bigger crop when paired with another variety," he says. 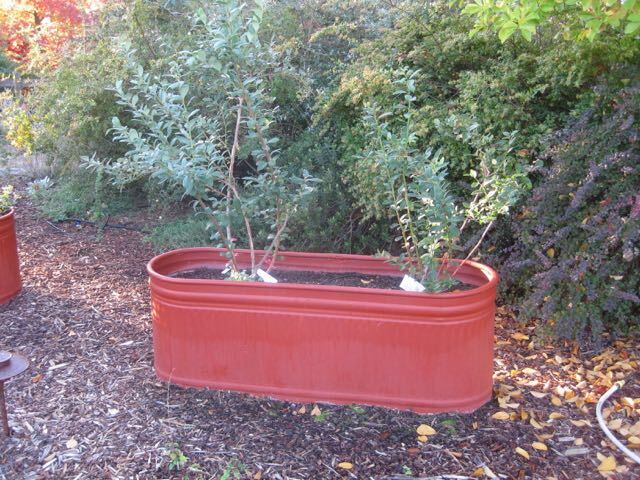 Laivo also advises planting blueberries in large containers, not in the ground. That way, you can give the plants the exact soil they need. "The trick is the soil mix," says Laivo. "Blueberries like a low pH around 5.5. And they like to grow in actively decomposing organic matter." That's an important point for those who plant the southern highbush blueberries in the ground. Blueberries benefit by incorporating well-decomposed organic matter into the soil. And the best organic amendment? Compost. Blueberries are in the same family as azaleas and rhododendrons (Ericaceae); wherever those plants are thriving in your yard is probably a good location for the southern highbush blueberries. 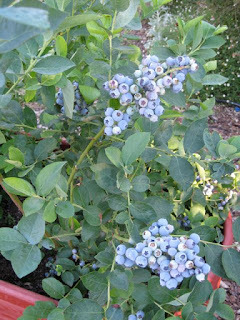 In a year or two, your biggest concern after planting these shrubs may be: what can I do with all the fresh blueberries? 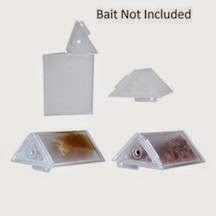 You may want to invest in a vacuum sealer and a bigger freezer!